Connect with mesmerizing collections in celebration of International Museum Day 2014. This weekend, the Cape Town Diamond Museum will be partaking in the ICOM (International Council of Museums) International Museum Day celebrations at the Clock Tower, Waterfront. 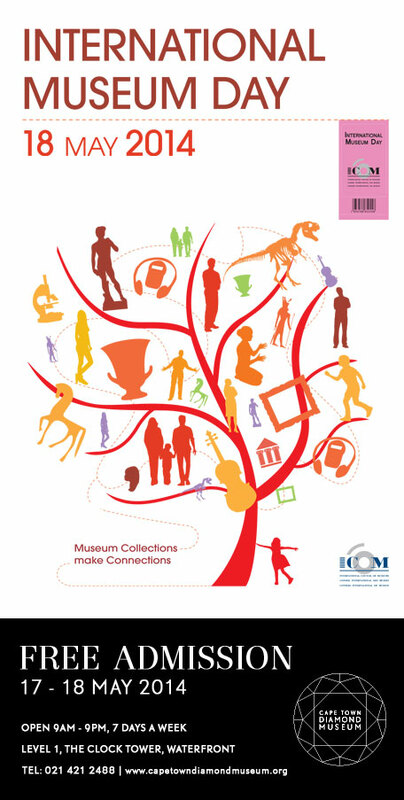 The objective of International Museum Day is to raise awareness on how important museums are in the development of society, and this year’s theme of “Collections make Connections” aims to remind us that museums are living institutions that help create bonds between visitors, generations and cultures. Since 1977, museums around the globe have participated in International Museum Day on 18 May, growing awareness about the importance of museums in today’s society. The collection of historical artifacts and life-size famous diamond replicas on display at the Cape Town Diamond Museum allows the visitor to truly connect with the wonder that is South Africa’s diamond history – taking you on a journey that begins with a diamond’s formation deep beneath the Earth billions of years ago to how they are cut, polished and graded. The personalised diamond tour concludes with a viewing of the Shimanksy diamond cutting and polishing factory, jewellery manufacturing workshop and a beautiful showroom filled with sparkling jewels. To celebrate International Museum Day, the Cape Town Diamond Museum is offering complimentary admission on 17 and 18 May 2014, from 9am till 9pm – so invite your loved ones and come learn about this fascinating part of South Africa’s history, and enjoy the visual delights on display. Book your diamond tour now to avoid disappointment here or call 021 421 2488.